We wanted to give you a heads up that the MadeMe MA1 Cat Bomber is now available on the MadeMe website. The jacket is typical of Erin Magee’s street-inspired womenswear line MadeMe that brings a feminine fit to a traditionally masculine garment. Plus, it’ll give your spring wardrobe a major dose of cat-ittude. The Made Me Cat Bomber from S/S 13 retails for $278 at MadeMeNYC.com and is available in both black and sage green. 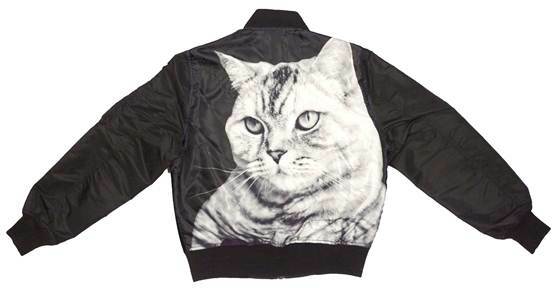 This entry was posted in Clothing, Fashion and tagged bomber jacket, cat bomber jacket, cats, MadeMe, meow. Bookmark the permalink.